“Los Angeles based bluesman Lightnin’ Willie has developed a particularly intriguing wrinkle on the genre, one that’s cool, airy, with a sinuous groove that infiltrates his audience’s consciousness and invariably gets them on their feet. He has no quarrel with mixing dance with the blues.” – LAWeekly. 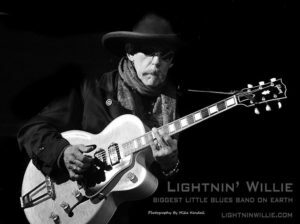 Nicknamed “The biggest little blues band on earth,” Lightnin’ Willie & The Poor Boys consists of Lightnin’ Willie on guitar and vocals along with Dennis Gurwell or Michael “Fireball” Murphy on keyboards/ bass and the pocket master Jerry Olson on drums. 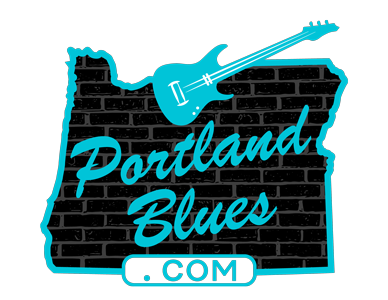 They are winners of two California Blues Challenges (Southern California and Ventura County) and Semi-Finalists in the International Blues Challenge in Memphis, and they play blues the way aficionados of the genre like it: hard, raw, and with a taste of the roadhouse. It is delivered with an honest integrity and love for the music, which is reminiscent of some of the legendary Texas and Chicago blues heavies. Lightnin’ Willie’s music is “real,” which is one of the best things you can say about an Americana / Bluesman. On Saturday, October 8, Lightnin’ Willie & The Poor Boys will return for the second straight year at the Blues, Brews & BBQ Festival at the Deepwood Estate, 1116 Mission Street SE, in Salem. This event is open to all ages, running from 4:00 – 7:00 pm. Advance admission is $10.00 for guests and $8.00 for members of Friends of Deepwood at Deepwoodmuseum.org. Day of show admission is $15.00 at the gate. On Sunday, October 9, you can also catch Lightnin’ Willie & The Poor Boys for an afternoon performance at The Birk, 11139 Hwy 202 in Birkenfeld, starting at 2:00 pm. Admission is $10.00.